The Carnegie Mellon Tepper School of Business Online MBA is a 32-month part-time hybrid program modeled for self-paced learning. Students in the program attend six “Access Weekends” per year, which are held at the university’s multiple U.S. locations. The weekends not only provide personal opportunities to connect with classmates, business professionals, and Carnegie alumni, but function as a bridge between semesters, introducing students to upcoming coursework. The program allows students to uniquely mold their career paths in consulting/strategy, entrepreneurship, finance, marketing, operations, or technology. The program also features a weekly 70-minute online course that allows students to virtually interact in real time. Students in the program will have access to material 24 hours a day, seven days a week. The program officially begins in September. The 32-month part-time program begins with Basecamp Orientation, followed by the first two “mini” semesters and a “Leadership Experience Week” in between. Beginning during the second mini semester, students undertake leadership and communication coaching, which continues to the culmination of the program. The second academic year begins with the Global Economics course, leadership workshops, and full-time employment recruitment, as well as the first available elective coursework. The third and final year of the program features a Capstone project and corporate networking opportunities, as well as the final aforementioned electives, leadership coaching, and employment recruitment. Throughout most of the program, Tepper online students will receive in-depth, hands-on career coaching, as well as expansive networking and employee recruitment opportunities. During the program, students also undertake career treks, visiting well-known companies throughout the United States, including Google, Amazon, Bain, JP Morgan, Microsoft, and more. Recent graduates from the part-time hybrid online MBA program at Tepper earn an average annual salary of around $117,000. More than 91 percent of recent students receive a full-time employment offer within just three months of graduation, with the majority being employed in the consulting, finance, and marketing industries. Tepper part-time online MBA interns earn, on average, $7,612 per month. Almost 100 percent of the class received summer internship employment. Most of the class that takes an internship does so in either the consulting or marketing industry. 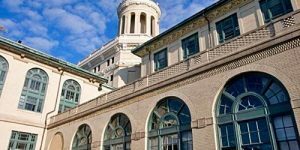 The total cost for new Carnegie Mellon Tepper Online MBA students is $16,500 per semester, plus $8,755 in additional fees, which includes room and board. Accepted students are eligible for numerous scholarship and fellowship opportunities, including the Yellow Ribbon Program for military veterans. All students are eligible for federal and private student loans. Applicants for the Tepper part-time online MBA program must submit an online application form, a current resume, academic transcripts, an essay, one professional recommendation, a $200 application fee, and GMAT or GRE test scores. Applicants born in non-native English speaking countries may have to prove English proficiency with TOEFL or IELTS test scores, unless they have earned an undergraduate or graduate degree from an English-speaking institution.